Last couple of weeks, I have been craving fried food. Churros, fried chicken, tempura, you name it. Of course I didn't get to have any of those because I don't like frying at home. And my cravings tend to turn to different directions if I'm at a restaurant. 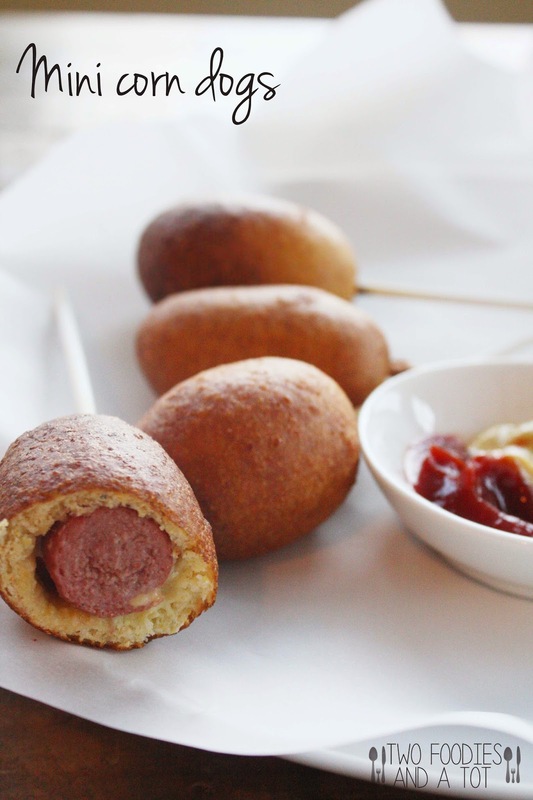 Then for some reason, I remembered wanting to try homemade corn dogs recipe I found from one of my favorite bloggers, damn delicious. When I first saw this recipe, it immediately brought me back my childhood memory. If you remember from one of my previous posts, my mom rarely let me eat street food. Corn dogs were always very tempting at fairs and when I ask her, majority of the times, she would redirect me but sometimes(but very rarely)she gave in and let me have one corn dog. To this day, I still remember enjoying every bite of the slightly sweet, fluffy, corn bready goodness hugging the savory hot dog. Mmm. As I was frying these, my tot woke up from his nap and was looking for me. Before he got grumpy, I went to attend him and I asked Steve to watch the stove for a second. And Tada~ we slightly burnt a couple of them. Haha. Oh well..We had some good ones too. I actually made them smaller. Instead of halving the hot dog, I cut them into three pieces each so it's the right size for my tot. Surprisingly, it tasted exactly like how I remembered. I have tried mini corn dog muffin trying to make healthier version but it had obviously different taste. It was good but not for my cravings. A lot of times I like baked version of originally fried dishes but unfortunately some things just have to be fried. It was such a quick process with not too much oil, thankfully it didn't make my whole house smell like frying. Phew! 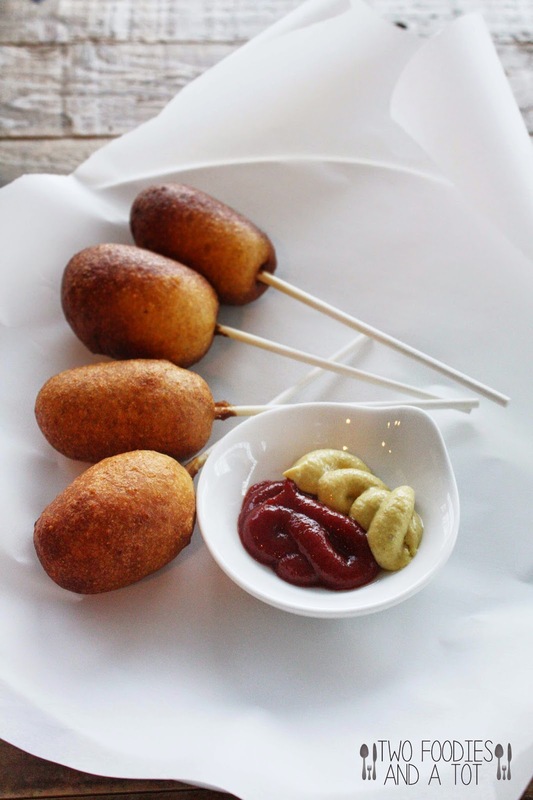 If you ever have cravings for corn dogs, you can simply make it at home with very little effort! 2. Put lollipop sticks in the cut hot dogs. 3. Combine flour, corn meal, sugar, baking powder, salt and pepper. Whisk together milk and egg, add the egg mixture to dry ingredients. Whisk until combined. It's easy to dip the hot dogs if you make the batter in a tall narrow vessel. 4. When the oil is ready dredge hot dogs in the batter to cover completely and fry each one until golden grown, about 2-3 minutes. 5. Place them on a paper towel lined plate. Serve immediately.